David came to Samaritan looking for a solution to change his smile without orthodontics. He had a canine that was protruding on one side, and on the other side his canine was a baby tooth, with the permanent tooth still way up inside the jaw bone. His local dentist wanted to do surgery and to bring the buried canine down with braces. Although the prescribed solution by his local dentist was the correct one, David didn’t want to do it because of both the expense as well as length required to achieve a result. At Samaritan, the dentists extracted the protruding canine, as well as the baby tooth canine. 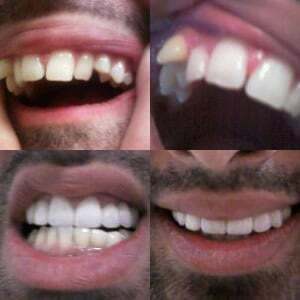 They put on two 3 unit bridges on the upper front teeth, plus 7 other all porcelain crowns. This gave him the desired look in a week.